Story Line : Ethan and team take on their most impossible mission yet, eradicating the Syndicate - an International rogue organization as highly skilled as they are, committed to destroying the IMF. 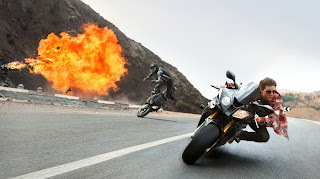 What's Good : It's full to entertainment package for Hollywood lovers, Those who are excited about what Tom Cruise will do beyond the limits after that MI4 Burj-E-Khalifa stunt? Than believe us this time also Tom will fulfill all your expectations with amazing stunts. Just every action sequence and stunts like Bike stunts, Amazing & impossible water stunts are awesome. Film has mind blowing twist and turns & also has mind blowing bike racing as said before. Performance of every single character is nice. Movie starts with a very amazing stunt which will surely excite the audience. What's Bad : No Indian stars this time! Like previous installments this one doesn't features any Indian stars. The latest installment, Mission Impossible: Rogue Nation follows the formula to the hilt and while it isn’t a classic, it’s still very satisfying. Our Opinion : Tom Cruise fans gonna watch it & also Hollywood fans will enjoy it very much. McQuarrie demonstrates that character dynamics are sometimes more powerful than kung fu-karate-slow mo fights. Still, some might feel let down by the ‘lack of action’ at the end – after all they’re watching a Mission Impossible movie. Well, whatever! The movie is hell entertaining and a must watch. Go get your tickets now!